This was not a trip of orient driven romance, but one of dull, bottom line economics. Less curry than cabbage; more brown nosing than elevation. 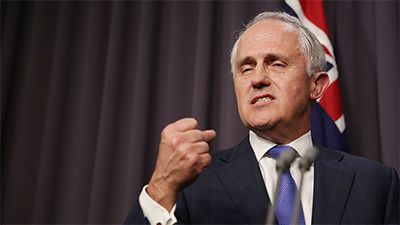 Australia's increasingly wooden Prime Minister, Malcolm Turnbull, did not exude colour or charisma as he was embracing the idea of India as a super modern trade market for Australian business. Instead of a cultural and effusive glow, the PM was obsessed by India as beacon, with emergent dollar signs for Australian businesses. A nagging feeling could not be dispelled: that he was the concubine at a sultan's penultimate inspection wishing to be picked for the night. No writhing bliss, just plain venal power. While other industries in Australia suffer in their terminal, unassisted decline, checking out at the office of the Grim Reaper of Manufacture and Economics, Gautama's plump and eager hands are out waiting for subsidies to grease them. He knows he is on to something good, even if every entity from potential financial backers to Greenpeace think otherwise. The idea that Adani is somehow going to be a heavenly boon for India's energy consumption is tantamount to praising the virtues of cyanide in illness. In modest doses, it won't kill, though it will leave an impression; given a kick along, and its will have the predictable, devastating result. One such voice is Vaishali Patil, who keeps reminding Australian politicians that they are dancing with a demon - and a mendacious one at that. In India itself, Adani has ravaged dozens of hectares of protected mangroves essential to water purification. As if that was enough, coal pollution “is killing our people and will continue to rise if we continue on the current trajectory” (The Saturday Paper, Apr 8-14).